DGP on Tuesday flagged off three motorcycle and four mobile vehicle for carrying out effective patrolling of the street of the capital city. 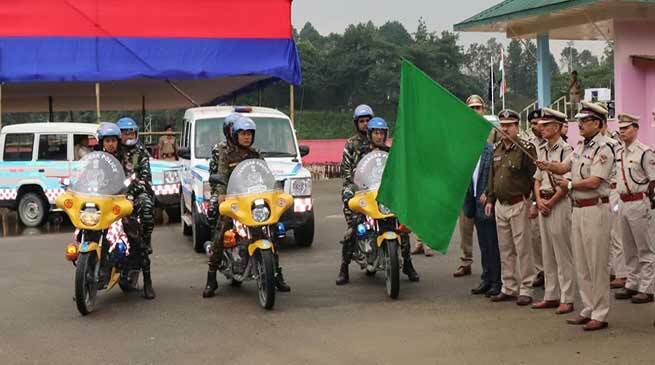 Director General of Police (DGP) on Tuesday flagged off three motorcycle and four mobile vehicle for carrying out effective patrolling of the street of the capital city and for maintaining of law order in the city. The flag off ceremony was held at IG Park in presence of all ranks of state police and officer from ITBP and CRPF. Addressing the officers DGP, SBK Singh said that the state government under the leadership of Chief Minister Pema Khandu, Home Minister Kumar Waii and support of his officer the state police is going modernisation in pace manner. He requested all ranks of officer to dedicate for the development of the police force and rededicate them self or the betterment of society by maintaining peace and tranquillity in state for all round development. Capital SP, M Harsha Vardhan inform that the patrolling vehicle have been fitted with GPS and equipped with emergency response items like first aid box, stretcher, rope and few more items which are required in emergency by the police personnel for helping the needy.